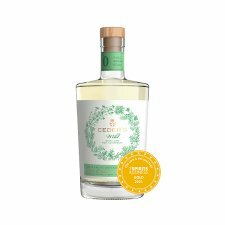 Ceder's is a distilled non-alcoholic alternative to gin. It is made with classic gin and rare Cape botanicals, and includes Buchu flavours, a magical plant used for thousands of years by indigenous people of South Africa, as well rooibos, both grown in the Cederberg mountains. Ceder's Wild leads with notes of juniper with hints of clove and rooibos. 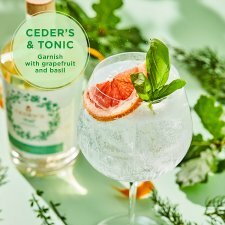 Serving Suggestion: Try the Ceder's Wild & Tonic with 50cl Ceder's Wild, 150ml Premium Tonic and garnished with a slice of grapefruit and a sprig of basil. Early 2017, Craig (South African) and Maria (Swedish) discovered a magical valley, home to many intriguing botanicals, in the Cederberg mountains of the Western Cape, South Africa. 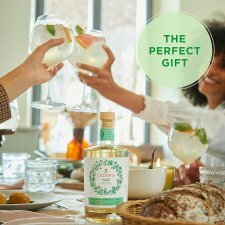 The valley, which they now co-own, inspired them to distil classic gin and exotic Cape botanicals, and then blend with ancient and pristine Swedish water. Store in a cool and dry place. Use within 3 months. Once opened: No need to refrigerate. Serve 50ml Ceder's with ice, then add 150ml premium tonic, and garnish.